I'm sure a good number of you are Whiskey & Gunpowder readers; I'm pretty sure I discovered them on TBP myself. I put them in my daily feed because their contributors seem devoted, as I am, to the idea that much of the so-called "wealth" late capitalist societies have stored up is imaginary, and that food, clothing, and shelter (and guns) will be more valuable than any denomination of dollars when The Big One hits. It's the same basic interest as I have in Jim's blog, except with a little more "head for the hills!" Also implicit in the aforementioned idea is the belief that The Big One is inevitable, even imminent. I tend to incline toward that belief as well, in the medium-ish term, which is what drew me to write for The Burning Platform, although my first post here was somewhat optimistic. I believe in the heroic potential of my Millennial generation (read Jim's feature, "Nuts! "), under the grizzly leadership of Generation X, but I also think it's a good idea to insure myself against catastrophe, in case the Boomers don't die off in time and This Thing goes down. So back to Whiskey & Gunpowder, they offer a lot of advice about how to prepare, both physically and financially. Many of their strategies sound good to me: agricultural commodities and deep-water oil exploration stocks as good bets, hedged with canned food, ammo, and kerosene. Of course, the biggest, brightest star in their portfolio, also quite popular around these parts, is gold. I want to talk about this mystical metal, this alchemical commodity, and I fully expect that you faithful readers will respond vigorously. I admit not being well-acquainted with historical gold trends, and I'm certainly not in a position to be buying gold myself (I need every cent of this temporarily strong dollar right now). But something about gold has always smelled fishy to me. I read the W&G feature today, entitled "Gold Is an Inflation-Proof Deflation Hedge," and I felt like I was being sold time shares at a ski lodge. They're totally above-board about the fact that they profit off of marketing gold, so you know W&G is selling to you, but I still can't shake the question of why people are so urgent about selling you gold, if it's such a "safe-haven" investment. Why would they get rid of it? Why would they exchange it for your dollars, even if they're getting a fee? I figure they must not believe in it all the way. 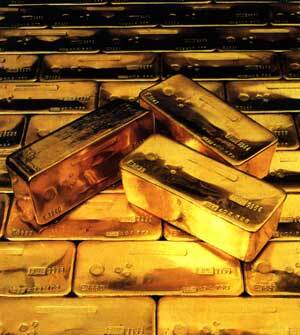 Questions: Is gold really a long-term investment? If so, what is its value? It's only functional value is as a medium of exchange, right? But post-Big One, why am I going to want it? Why am I going to accept it in exchange for my life-saving, valuable things? I'd only do so on the assumption that others want it, and because there's a consistent amount of it, so there's only so much to go around. In that case, it has an advantage over a fiat currency, sure. But I expect that, in a real crisis, I would rather have rice or bullets than gold. With the pressure on, who's going to accept as exchange something that's only a promise of something valuable, rather than something one can actually use? Something that grows, something one can build with, wear, wash with, or do something else necessary? Jewelry-making is not a very productive activity. So my hypothesis is that the people and entities with serious commitments in gold, the ones advertising to you on Glenn Beck as well as the governments, are cynically manipulating the price of the shiny substance in order to achieve maximum standing in worthless money, whenever the currency winner emerges. They're not really about The Big One; they're about status quo. But like I said, I don't really know what I'm talking about. Please enlighten me.